There is a slight problem when you’re trying to analyze freshness, and that’s because Google doesn’t always show dates next to search results, so it’s not always obvious whether freshness matters in a particular vertical or for a particular search query. I should say it was a problem – before I made an accidental discovery. A few weeks ago I was playing with one of the tools Google offer its users and found that if you change a certain setting, you can find the specific date Google assign to any URL in their index. It also sparked quite a bit of new insight, with two replies to this thread showing how to get similar results without the tool I used. As Twitter can be hard to keep track of at the best of times, I decided to write up an article so all of the tips were in one place. You may be wondering why you would want this information – which we’ll get to – but a big one for me is to check if Google noticed your “last updated” or “last modified date” when you change an article. Having your content be perceived as fresh can provide a major boost in rankings, but only if Google thinks your content has been updated. Now you’re going to learn how to know if that actually happened. This is how I made my accidental discovery so let’s start here. Head on over to https://google.com/cse and log into your Google account. You’ll then be presented with a screen like the following which lets you add the sites you wish your custom search engine to show results from. You also have the option to name your search engine, which is totally up to you. This isn’t expected to be something you share in public so pick any name you like. It doesn’t really matter which sites you add, for now, so feel free to add one of your own or a competitor’s. Once you learn how this works you’ll have more reason to add specific sites later on. With a site or two added, it’s time to save your first Custom Search Engine and then click on the small hyperlink icon to access it. You can see this highlighted in green below. This will open a new page where you can query your new search engine for anything that you like. As we’re just showing how this works, enter something simple like “Hello” or another word that will definitely pull back search results. Here are my own results for that query. You can see that some results have dates next to them, but not all. What you then want to do is change the ‘Sort by’ option in the top right of the results to ‘Date’. Then every result will appear with the date Google assigns to it. Now that you can see how it works, you can add any site you like that appear in SERPs you monitor and look at the date Google assigns to the results. To find specific URLs you can just search for the title of an article in quotes and the date will be revealed. After we share the other two options to bring back these dates we’ll look into exactly why you would want to be able to see them. After my original angle received some attention, other people started suggesting alternative methods. One of those came from Patrick Stox, who suggested that you use Google’s Tools button (desktop only) to change the date range for search results. Simply enter the query you are looking to find the date of results for and then in the Tools menu, click on the date range option. You’ll likely need to set a time span of a few years to make sure a specific result shows, but the dates should appear next to the results after you’ve done this. My only problem with this option is that results don’t stay in the position they were in before. I’ve seen results go from Page 1 to 2 once they’re now sorted by timeframe, which makes finding specific URLs a little bit trickier, but it can also be much quicker than adding a new site to a custom search engine. Another suggestion brought to us by Mike, which seems to work really well, is to first search for the URL you wish to find an associated date for. If the date doesn’t show automatically, head over to your address bar and add the following to your search query: “&as_qdr=y15” (without the quotes). What you’re essentially doing is making sure Google goes back as far as 15 years to assign a date to the URL, and it only looks for that specific URL as that’s the search query you entered (unless you choose a homepage). Now you know how to find the date Google associates with a page, you’re possibly wondering why you would want to know. The first reason, and the most important to me, is that you can predict whether freshness is a large part of why pages are ranking in search results. There are said to be more than 200 Google ranking factors, so we don’t know how big recency or freshness is as part of that, but I think it’s fair to say the ranking factors change based on industry and type of search query. Specific medical questions which might save lives tend to have less volatile search results, whereas product reviews and gift recommendations tend to favor more recent content as previous articles may be out of date and no longer relevant. To get a good idea of whether Google is ranking something because of freshness you can check if most of the first page results were published or updated within the last few years. 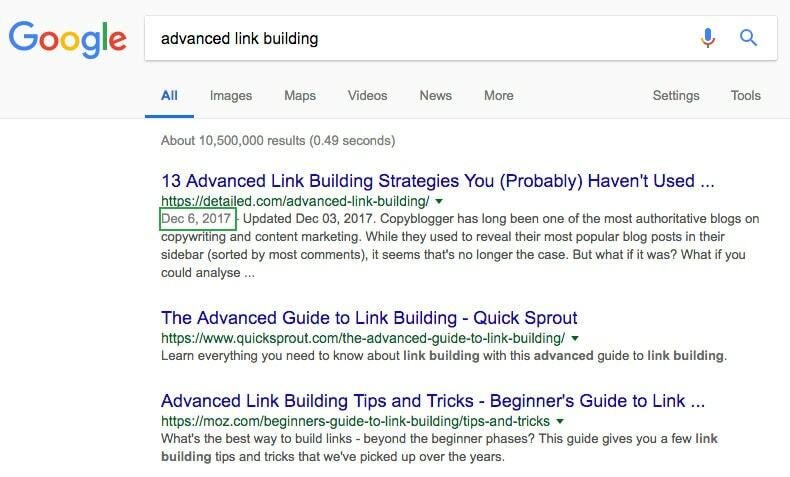 Right now my advanced link building guide is first in Google, likely due in part to how recently Google thinks this particular article was updated. To be sure, I would need to check the dates of the other sites ranking, and using these “tricks” is the only way I know how to do that. If more than two results were published or updated recently, it’s generally fair to say that freshness plays a part in those specific rankings and you may stand a chance of ranking if you publish something new or update an existing article. This is especially useful if you’re doing keyword research and looking for new terms to target. If you update your content and Google picks up on that, they will update the date associated with your article. I have articles written years ago which have now been updated and have a new date associated with them. However, there are cases when Google doesn’t pick up on your updated date which may alert you to some on-site or crawling errors you have. For example, we can see Buffer updated an article in 2018, yet Google still associates it to being last updated in January of 2017. If we look into the Buffer site to see why this is happening, we can see two dates associated with the post. This is likely confusing Google, and meaning Buffer isn’t getting the freshness credit it could be for updating their guide. If you weren’t able to see the date Google assigned to the article, you could perform one of the three checks we shared above, and then see there is a potential on-site issue you could be working on. There are likely many other valuable uses of knowing the date Google assigns to something, but those are the two big ones for me. Screenshots by Glen Allsopp. Taken April 2018.